Aerosols are considered a prime environmental medium of concern with respect to potential future releases by the WIPP because airborne contaminants can rapidly disperse, can be transported over long distances, and represent a significant mode for uptake by humans and other organisms. CEMRC studies of aerosols focus on both man-made and naturally-occurring radionuclides (including those known or expected to occur in the wastes to be deposited at the WIPP) and selected non-radioactive, inorganic constituents. Aerosol sampling is conducted at four locations as part of the WIPP EM, with samplers operating continuously at each location. The locations include a port inside the WIPP exhaust shaft, a site approximately 0.1 km northwest (downwind) of the WIPP exhaust shaft (On Site station), a site approximately 1 km northwest (downwind) of the WIPP (Near Field station), and a site approximately 19 km southeast (upwind) of the WIPP (Cactus Flats station) (see Fig.2 of the 2000 Annual Report). The sites were selected on the basis of the prevailing wind directions at the WIPP. In designing aerosol studies, it is widely recognized that there is seldom a satisfactorily defined “”control”” location that is far enough from a source to ensure isolation from aerosol releases, while adequately replicating key ecological features of aerosol composition, soil, topography, biota and weather conditions. The Cactus Flats location represents a reasonable compromise to approximate a control location for surface parameters, based on average conditions. Sampling in the WIPP exhaust shaft (Station A) consists of collection of one or more filters daily (Monday through Friday) from a Fixed Air Sampler (FAS), that is operated with an average air flow of 56 L min-1. The daily FAS samples are subjected to gross alpha/beta counting individually. The five daily (Monday – Friday) samples from each week are composited for weekly gamma counting and all weekly composites are combined each calendar quarter for analyses of Pu and Am by alpha spectrometry. This sampling is a workplace monitor that provides a gross check of emissions on a short resolution time-scale (for daily and weekly samples), with a higher sensitivity check for cumulative emissions over a three-month time scale. (Collection of FAS samples by the CEMRC began in December 1998). At the other three stations, aerosol samples for radionuclide analyses are collected using high-volume samplers (approximately 1.13 m3 min-1). These samplers are operated to maximize particulate loading without impacting air flow, so individual samples are collected for periods ranging from three to six weeks, depending on levels of particulate deposition. By focusing on high particulate loading, this sampling allows collection of sufficient mass for quantitative determination of the manmade alpha-emitting radionuclides (Pu and Am) at background levels via alpha spectrometry, which was of particular interest in baseline studies. Low-volume samplers (10 L min-1) are operated for collection of samples for analyses of non-radioactive, inorganic constituents (trace metals and selected ionic compounds). Analytical methods for inorganic constituents do not require large sample concentrations, so low-volume sampling includes two 2-day samples, and one 3-day sample weekly. All three stations support one high-volume sampler collecting total suspended particulate (TSP) matter and one low-volume sampler collecting TSP. The Near Field and Cactus Flats stations also support a second high-volume sampler collecting particulate matter less than 10 mm aerodynamic equivalent diameter (PM10). 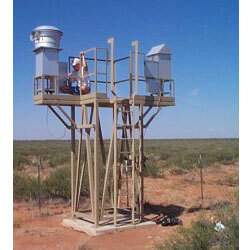 Since November 1998, dichotomous low-volume samplers have been operated at the Near Field and Cactus Flats stations. The dichotomous sampler is an EPA-equivalent reference method for sequential measurement of both PM10 and PM2.5. With respect to human health, PM10 and PM2.5 are the particulate classes that are generally recognized as the most significant of the respirable aerosol components, and it is important to characterize the natural temporal and spatial variation in these components that would impact potential uptakes of WIPP contaminants by humans. Until the end of March 2002, both low-volume samplers (“lovols,” 10 L min-1)and Graseby-Anderson dichotomous samplers (dichots) were used for collection of aerosols for the studies of non-radioactive, inorganic constituents, specifically trace elements and selected water soluble ions. The WIPP-EM underwent major restructuring in FY 2002, and afterwards sampling for the non-radiological aerosol analytes was done using dichots exclusively. In November 2004, the collection of aerosols by dichots was discontinued. See the 2005-2006 Annual Report Chapter 1, “Ambient Aerosol Studies for the WIPP-EM”.